Dr. Whitney is a caring individual who has developed a passion for helping others. After 7 years of practice, thousands of successful treatments, and through personal experience, Dr. Whitney has had great success helping patients both get out of pain and improve the function of their bodies. His approach starts with listening to the patient, identifying the underlying causes of pain and/or dysfunction, and using the appropriate techniques to resolve the problem. Dr. Whitney grew up in Jacksonville, Florida. Living on a sailboat until the age of 10, he was instilled with a passion for being on the water and has been an avid surfer, diver, and fisherman ever since. His high school years were devoted to wrestling, pinnacled by competing in the state championships his senior year. His dad moved to Tequesta in the late eighties and after spending many summers in the Jupiter area, Dr. W knew his plans for the future would be residing in the tropical Palm Beach area. His undergraduate studies were at The University of Florida where he gained a new passion for the Florida Gators. As the captain and a surfer for the UF Surf Team, Dr. Whitney helped the team qualify and compete for a national collegiate surfing championship in 1997 in Southern California. Dr. Whitney was inducted into the University of Florida Surfing Hall of Fame in 2015. 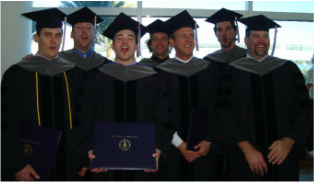 Graduation with "The Surf Trust"
After finishing undergraduate in 1999, he moved to Palm Beach Gardens and settled into a career in the medical sales field. As a people person, medical sales was good and he was happy in his career. In the summer of 2004 sustained a life changing injury. 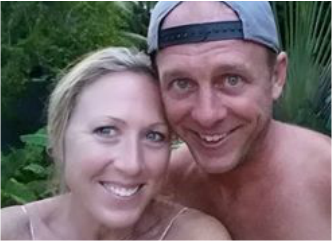 (See story below) After recovering and realizing the importance of good health, he attended Palmer College of Chiropractic and graduated as a Doctor of Chiropractic in 2010. Dr. Whitney quickly became certified in Active Release Technique, as he knew how successful this technique was from personal experience. Working for close to 2 years at a family practice in Melbourne, Dr. Whitney gained great experience, saw amazing results with patients and developed a passion for helping others reach their bodies' physical potential. Dr. Whitney surfing in El Salvador. In 2012, Dr. Whitney moved back to Palm Beach Gardens and spent a short time working in a personal injury clinic before acknowledging it was time to open up his own practice. By summer of 2012, Whitney Chiropractic and Massage was born! Dr. Whitney now has the experience of over 30,000 successful treatments and counting! Dr. Whitney adjusting patients in the Dominican Republic. The pain took over my life. I was unable to lift more than a couple pounds without extreme pain. I could not eat too much as my stomach would push against the injury and cause relentless pain. It is near impossible to describe how bad the pain was...at times I would get noxious and start vomiting all purely due to the pain. The worst part was I didn't know how to fix the problem or get out of pain. I could no longer surf or participate in any sport. I could not even walk without going at a snail's pace to keep from aggravating the injury. As someone with any kind of passion can appreciate, I became very depressed as my life was taken away from me by this injury. Over the next year and a half, I went to many different medical doctors trying to fix the problem and get out of pain. No one was able to pinpoint the problem and the doctors tried to treat the symptoms. I kept looking for answers as I was desperate to get my life back. By this point I had lost close to 40lbs both from muscle atrophy due to inactivity and from lack of eating due to the pain a full stomach caused. Dr. Whitney surfing a hurricane swell in Central Florida post-injury. It was now that I entered a special chiropractors' office. This chiropractor was able to diagnose through hands on palpation what was going on under my rib. I was unsure at the time, but he was my last resort. Because the injury was very severe, I spent more than 3 months working with the chiropractor. Each visit, he preformed a method of soft tissue realignment that broke up the scar tissue that was causing the problem and the pain. I began to get my life back. After close to 6 months of rehab and regaining muscle I had lost, I started surfing again. Two years after it had begun, my life was back! I came out of the injury with a new appreciation for life and shortly after decided to go to chiropractic school. This chiropractor had essentially saved my life and I wanted to impact the lives of others the way he had done for me. Having that said, I empathize with those in pain. I empathize with those that have had their passion taken away from them or can no longer perform as well as they used to due to physical ailments. I want to keep others from going through what I did.